You know, my good buddy Ally Bishop has a wonderful rule: "90% of everything you do should be about somebody else." This week, I am breaking that rule into tiny well-intentioned pieces. Because when somebody else gives you a platform to talk about yourself, you can't exactly neglect to showcase their kindness afterwards, even though their efforts are technically all about you. 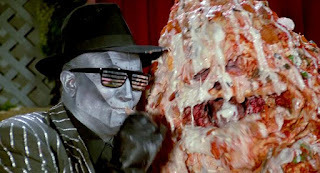 It's an ourobouros of socially-acceptable narcissism - and I am devouring myself like Pizza the Hutt. well, that's probably for the best. Civilian Reader - Don't Hold the Horses! And don't let them be featureless expendable inventory items, either. Here's an introduction to all the fun and plot-twisting adventures you can have with your story's four-legged fantasy Ferraris. RisingShadow.net - Fine Dining in Fantasyland Come for the story, sure – but stay for the butterbeer, the lembas, and a big, fresh, still-squirming plate of gagh. Let's talk fictional gastronomy – and while we're at it, let's make the case for moving the menu beyond hardtack and stew. Interview with Jan Edwards Step right up, folks! SEE the secrets of cowboy lingo revealed! MARVEL at the insufficiency of allegorical representation! SHUDDER as I wax distraught about the carnival of tedium that is modern living! And if you've read this far - well, feel free to call in a favor, because I owe you 90% of my everything!